Installing your WhatToDo feed on your WordPress website feeds thousands of pages of dynamic content onto your site.Please be patient. You’ll be receiving a HUGE amount of data from WhatToDo during this process, so please wait for the plugin to load fully before clicking any additional buttons or restarting the process. Doing so may crash your system and require you to restart your WordPress server. Follow these steps in the order they are presented. Click “Save Changes” (in the blue box at the upper right) if you have to stop before completing the setup process. Go to Plugins –> “Add New” –> “Upload.” You’ll need to locate the file you just downloaded and saved on your computer from WhatToDo. You can drag-and-drop the file or find it by name from the location where you saved it. There should now be a new item in your lefthand navigation bar that says “WhatToDo.” Click it. There will be another big push from WhatToDo with a waiting screen. When the waiting screen disappears, click the blue box “Next” or select “Feed Settings” on the left of this screen. Physical Address: On the page with the map, enter your business’s physical address. It MUST be a physical address – not a PO Box – or it will not show up on the map. If you have no physical address, use a street name or intersection close to you. Click the blue button that says “Place Address on the map.” Click “Next” or go down one item on the menu on the left of the page. However, what if your business has a partnership with other businesses to cross-promote on your websites? You’ll want select “Include certain activity providers” and type each business (and/or use the Autosuggest) into the box. If you accidentally select the wrong business, simply click the X to the left of their name, and they’ll be removed from the box. There may be certain activity providers you wish to exclude. For example, if you have recommended a business to customers, and they had an unsatisfying experience, you may not want to have that business listed on your website. NOTE: If you want to exclude ALL businesses of a certain type, you can do that later. This section is to individually choose businesses to include or exclude on your website. Click “Next” or go down one item on the menu on the left of the page. Locations: Each WhatToDo “Resort Area” is subdivided into different smaller geographic areas. It may be by towns or neighborhoods or quadrant of the city, depending on what makes sense in your location. The feed will automatically include ALL Locations in your Resort Area. If you wish to exclude a certain Location, click on the box and select it from the options. Again, if you make a mistake, click the X to the left of the name, and it’ll be removed from the box. Categories: This is where you can choose what business Categories you want to include, by putting a check in the box next to the Category name. If your business is a hotel, you probably don’t want other hotels showing up on your website, right? So make sure the box next to “Hotels & Motels” is NOT checked. Take a moment to click on each Category individually. You’ll see that each one automatically includes certain Subcategories. You also have control of these with, so you’ll want to familiarize yourself with the Subcategories under each Category. For example, you’ll probably want to include a “Shopping” Category, but if you don’t want “Wine & Spirits” or “Marijuana Dispensaries” showing up on your website, you’ll need to un-check those Subcategories. If you don’t want any shopping at all on your website, uncheck the Shopping category. NOTE: Any time your return to the WhatToDo plugin in your WordPress dashboard and change your settings, it will NOT update the info already on your site. It will only update future info imported. To change how these things appear with the content already on your website, you will need to do a few more steps. Under “General Settings” is a black menu item “Advanced Settings.” Select it. Choose “Delete All WTD Imported Data.” This will delete your old settings and data and do a new import with your new settings in place. A full import of the WhatToDo feed, takes some time and is a drain on the server, so we recommend doing this process rarely, only when necessary. 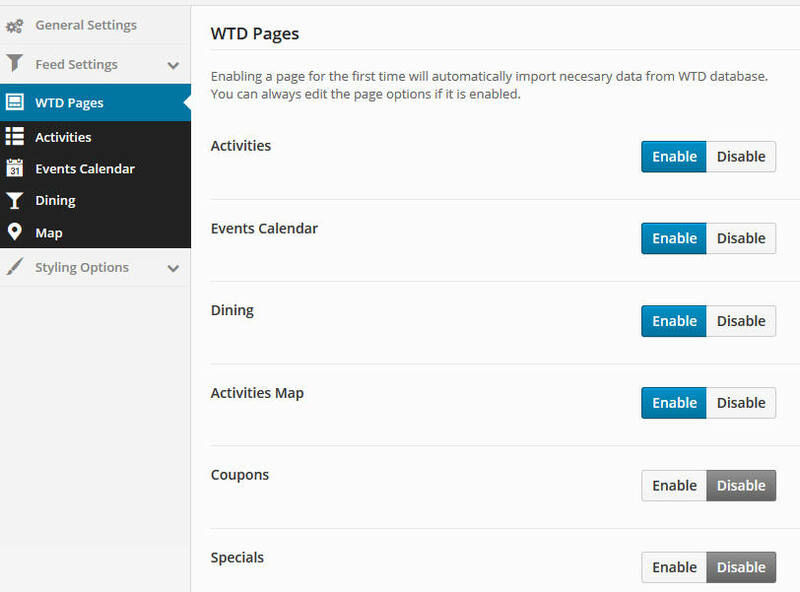 Go to WTD Pages and choose which pages you want to enable. The plugin will automatically create a page and a menu item on your website for the ones you select. Each page that you enable will appear below “WTD Pages” in the menu at the left of the page. 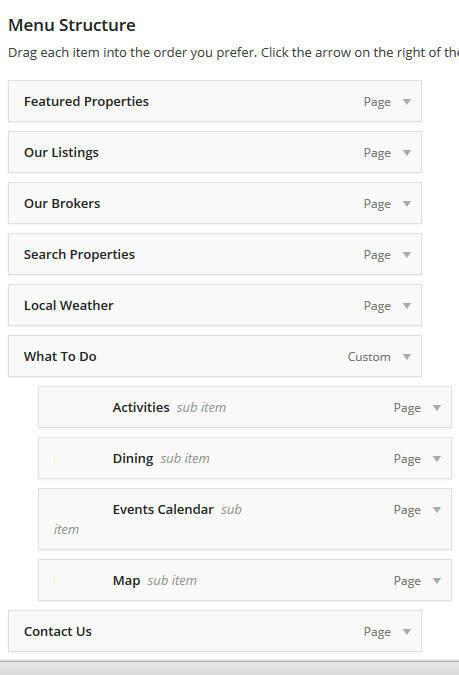 You will need to select each of these pages individually in this menu to set the layout for that page. You can determine what type of menu you want, sorting criteria and images. The term “Mosaic” refers to several rows of images instead of simply text. Feel free to try different options, save your changes and check how it looks on your live website. You can customize according to what looks best on each page. When you’re finished, click “Save Changes” (in the blue box at the upper right). Go to the WordPress navigation pane on the far left of the screen. Make sure you’ve saved all your changes by clicking “Save Menu” and check your work on your live website. You’re finished! We hope you’re as excited as we are about your new resort website! From time to time, WhatToDo will improve its product and release a new version of the web feed plugin. You can see this when you log in to your WordPress account by going to “Plugins” in the left hand menu. On the plugins page, you should see a menu item for “Update Available” that notifies you that you need to take an update. Choose “Delete All WTD Imported Data.” This will delete your old settings and data and do a new import with your new settings. A full import of the WhatToDo feed, takes some time and is a drain on the server, so we recommend doing this process only when necessary. After making these changes, please clear your web browsing cache so that the newest version of the page is allowed to display. Go to “General Settings” and copy the Client Key. Once you have deleted the plugin, download the newest version from WhatToDo and install it in your WordPress site, then activate it. The first thing you will need to do once it’s installed is a Hard Data Reset. 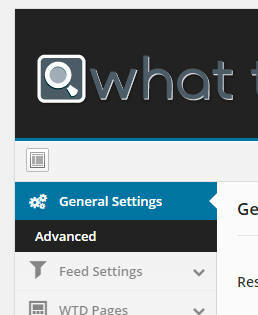 Go to the “What To Do” menu item in the lefthand WordPress menu. Go to the “Advanced” menu item under General Settings. Choose your website’s resort area and click “Save Changes.” You will then have to go through the same process of creating your feed account settings that you did the first time.